In tomorrow’s Wall Street Journal there is a symposium on monetary policy in which Richard Fisher, Rick Mishkin, Vince Reinhart, Allan Meltzer, Ron McKinnon and I participate. One of the points I make in my piece is that another massive dose of quantitative easing is not appropriate now. I briefly explained the rationale for this point of view in a post on this blog several days ago, where I referred to Milton Friedman’s advocacy of stable monetary policy rules. A number of people wrote to ask me about that post, and Scott Sumner has written a thoughtful blog entry about it, quoting Milton Friedman on Japan. I completely agree that the problems in Japan in the 1990s stemmed from a sharp decline in money growth compared with the 1980s, from 8.9 percent per year during 1980.1–1991.4 to 2.6 percent per year during 1992.1 – 2000.1 as shown in the Table and Chart in this speech I gave at the Bank of Japan. This decline in money growth was a discretionary action which Friedman, Allan Meltzer, and others rightly criticized. This criticism is quite consistent with Friedman’s view that we should avoid large discretionary changes in money growth and instead follow a constant money growth rule. To correct this mistake of a sharp decline in money growth, Friedman recommended that the Bank of Japan increase money growth but “without again overdoing it,” presumably taking money growth back to the more appropriate levels of the 1980s. Now consider the current situation in the United States. We did not see the same kind of decline in money growth as in Japan going into the recent recession. The US recession began in December 2007. Measured over 12 month periods, M2 growth rose from 4.8% in January 2006 to 5.9% in January 2007 to 6.0% in January 2008 to 10.4% in January 09. Then, as a result of quantitative easing, which began in September 2008, the growth rate of the monetary base (using the same 12-month measure) increased from 2 percent to over 100 percent which helped increase the growth rate of M2 and other monetary aggregates. See chart. Now as the size of the Fed’s balance sheet did not keep growing at such a rapid pace, the growth rate of the monetary base (and M2) has declined. Another large dose of quantitative easing would again send the growth rate of money soaring, but then only to decline again as it has recently. 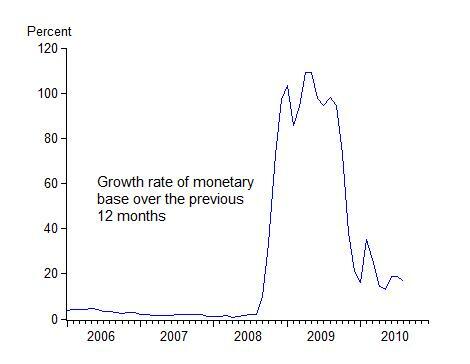 So quantitative easing as practiced by the Fed has increased the volatility of money growth significantly. Money growth volatility is something Milton Friedman was surely against. In his Newsweek column of December 1, 1980 entitled “The Fed Fails—Again” he wrote “The key problem has been the erratic swings [in money growth] from one extreme to the other that have produced uncertainty in the financial markets and instability in economic activity.” On top of all this, my research shows that the impact of quantitative easing on mortgage rates or other long term borrowing rates has been quite small and statistically insignificant. I hope this additional information is helpful.